This is a unique three-day MasterClass that is dedicated to Organization Development and Change. 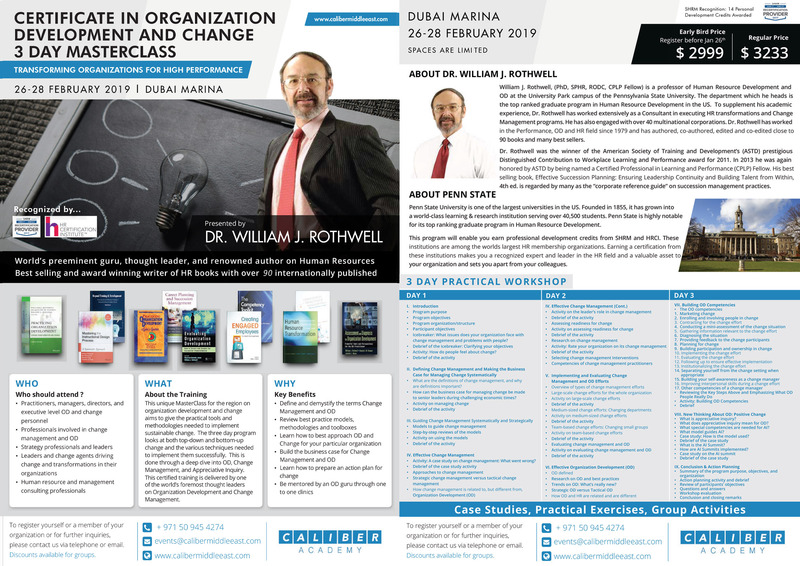 This exclusive training program will be conducted by renowned OD thought leader and author of over 90 books – Dr. William J. Rothwell. He is also a professor at Pennsylvania State University, a top 100 global business school and heads the department which conducts the top ranked graduate program in Human Resource Development in the US. This masterclass focuses on demystifying organization development and change management and driving both bottom-up and top-down transformations sustainably in organizations. The training gives unique insights into the best practices utilized in OD & Change while providing the needed practical frameworks, techniques, and tools exhibited by the world’s leading organizations. It will also enable you to earn professional development credits from SHRM and HRCI thus adding value to yourself. Don’t miss your chance to enroll in this course and start making change happen in your organizations.